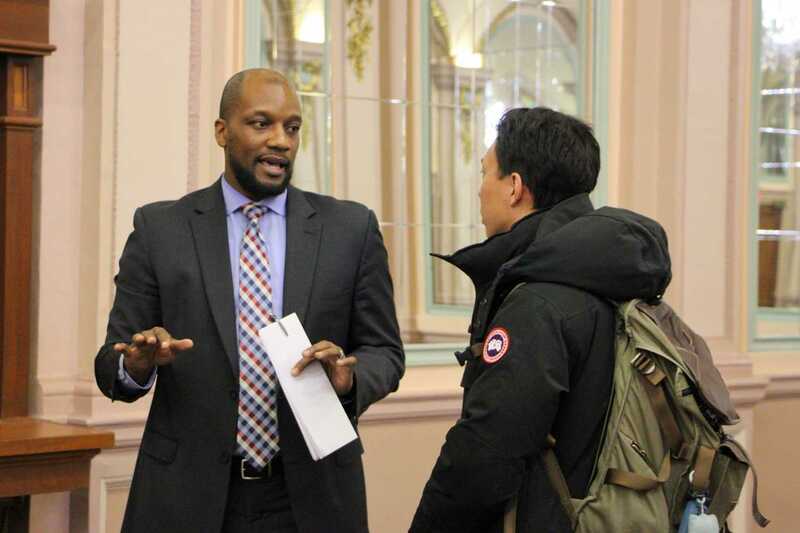 Dean of Students Kenyon Bonner said Tuesday that he will lift the Greek life social probation after what he considers “meaningful progress” is made in improving the safety of fraternities and sororities at Pitt. In an interview with The Pitt News, Bonner discussed the response to a Jan. 18 off-campus recruitment event held by Sigma Chi that led to a student being hospitalized for excessive drinking. The incident led Bonner to place Sigma Chi on interim suspension and all of Greek life on modified social probation, banning them from serving alcohol at events. Bonner wrote a letter to the Pitt community last week saying Pitt police found no evidence of criminal hazing and police are not pressing charges. But Tuesday he said Sigma Chi and the fraternity’s members will still go through Pitt’s conduct process. City police are also actively investigating the incident. For now, Bonner said, members of Sigma Chi are still permitted to live in their upper campus house, but the status of the house could change depending on sanctions. Bonner and Summer Rothrock — the director of the Office of Cross Cultural and Leadership Development — spent much of the interview discussing the culture of Greek life at Pitt, and the progress they want to see students make to improve it. But Bonner gave few details on what would constitute “meaningful progress” to lift the probation. Bonner said he tasked student leaders in the Greek community — from Pitt’s Collegiate Panhellenic Council, Interfraternity Council and National Pan-Hellenic Council — to come up with both a short- and long-term plan to ensure student safety and change the overall culture. After Bonner met with students Friday, he said they agreed there was more work to do, but he was encouraged with the start. “The short term is really about what we can do in the immediate future to ensure that this doesn’t happen again. And reduce risk, which is something we’ve always been concerned with,” he said. He said he had a productive discussion with the three student presidents Friday about “strategies, policies, procedures and practices” to consider for the short-term plan, borrowing some ideas from other universities. Rothrock added that one idea they discussed was “pre-education sessions,” where students who are rushing a fraternity or sorority must attend a session prior to receiving a bid. She also said they talked about employing a buddy system and limiting events with alcohol. Fraternities and sororities have a “unique position on many college campuses” as the only organizations that can hold social events with alcohol, Bonner said. In an email after the interview, spokesperson Joe Miksch added that Greek organizations at Pitt are insured by their national organizations, a factor in the University allowing them to serve alcohol. The long-term plan for Pitt’s Greek organizations, Bonner said, is to change the culture of drinking on campus. Bonner encouraged Greek leaders to reach out to other chapters and national headquarters to come up with strategies they think could work at Pitt. Pitt already has policies — like banning alcohol at recruitment events — that should help avoid incidents like what happened at the Sigma Chi event, Bonner said. Pitt has hosted programs to “ensure student safety and make students aware about the risk of alcohol,” he said, along with anti-hazing and sexual misconduct programs. The probation was intended to be a pause to reflect on the Greek community and ensure no other student was at risk, Bonner said. “What is it about the culture — at least on college campuses and more particularly in fraternities and sororities — where this has become a common occurrence on many college campuses?” Bonner said. Ashwini Sivaganesh and Mackenzie Rodrigues contributed reporting.